With squash being such a high intensity and dynamic sport, injuries are unfortunately relatively common. Sprains and strains within the joints can occur from too rapid a change of direction, mistiming a step, or over-lunging onto a ball. As well as these more sudden trauma injuries, people who regularly participate in physically challenging sports can also be very susceptible to over-use injuries. One of the most common of these in racket sports is the dreaded lateral epicondylitis, more commonly known as ‘Tennis Elbow’. In fact, both of the commonly used names for the condition are actually misnomers – the problem is certainly not limited just to tennis players, and the more correct medical terminology would be lateral epicondylosis (the suffix ‘itis’ refers more to an inflammatory issue or disease). Whatever the name used however, it is a condition that brings misery to thousands every year – some estimates suggest that around 5 in every 1000 people in the UK go to see their GP about tennis elbow, and as many as one in three people will display some of the symptoms of the ailment at any given time. The elbow is rather a complex, crowded joint, with 16 muscles crossing it. With all of the muscles and their tendonous attachments so close together, problems in this area in active people are commonplace. Tennis elbow is specifically characterised by pain in the outside of the upper forearm region (often also radiating down toward the wrist), and around and just below the bend of the elbow. Sufferers may find it difficult to fully extend or bend their arms, and will often report additional pain when lifting, gripping, or twisting with the affected arm. Pain is often reported to be more prevalent in the morning, after sleep. Despite being primarily considered an overuse injury, it’s not uncommon for tennis elbow to arise from sudden trauma such as a direct blow to the elbow region, or an unexpected forceful exertion through the area (such as a mistimed shot in squash). 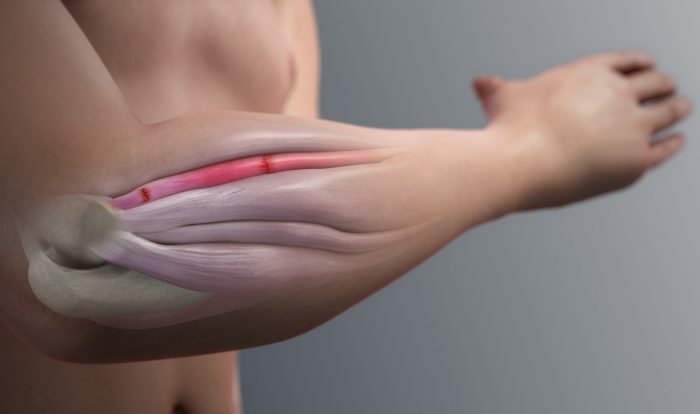 Tennis elbow can be brought on or exacerbated by a number of things, but two of the more common issues specific to squash players relate to either technique or equipment. In terms of technique, if you’re suffering from any elbow pain it may be worth getting an experienced coach to look at your technique to check for any improper wrist/elbow action that may be contributing to the problem. It’s always recommended to get assessed by an appropriately qualified physiotherapist with any musculoskeletal complaint that lasts for longer than a few days, but the technical input from a coach may also be very useful in managing tennis elbow – the backhand stroke in particular can be the root of the issue due to the forces that go through the wrist/elbow during the shot. Equipment-wise, both your rackets grip and the string tension can also contribute to tennis elbow. A grip either too big or too small can cause issues (again, seek an experienced coach’s input if you have any concerns in this area), while too high a string tension in a racket can also cause stress within the elbow joint. The frame weight and balance of your racket may likewise also play a role in tennis elbow, particularly if you’ve changed from one extreme to another without a suitable gradual acclimatisation. As with almost all sports injuries, prehab is better than rehab. One of the reasons you very rarely hear of professional squash players (or indeed any elite level racket sports player) suffering from tennis elbow, is due to the fact that they are generally better conditioned and have a more consistent technique than the average recreational player. 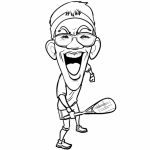 There is no reason why the amateur squash player can’t also give themselves the best chance of avoiding the condition ever occurring however, by following the professional lead and working to develop their swing technique and partaking in a proper strengthening programme – focusing not just on the primary surrounding joints at the wrist, elbow, and shoulder, but also on working the full body to ensure overall balance and synergy. If tennis elbow does hit you though, there are a number of things that you can do to treat it. Firstly, in the early acute stage of any episode of pain, simply resting the joint and applying ice can provide short-term relief (while ice is usually applied for inflammatory issues, many tennis elbow sufferers still report temporary pain relief from ice application). Often just resting the area and dealing with the pain can be enough to avoid the issue becoming more serious. If discomfort doesn’t subside from rest, then a strengthening and rehabilitation intervention is the next step. It is always a worthy recommendation to see a physiotherapist to have the joint checked to ensure there are no other issues or complications compounding the area with your particular circumstances, but assuming everything is fine the exercises/stretches that are usually prescribed tend to be fairly similar. Various flexion, extension, and supination actions are typically used, to regain full pain-free movement in the affected area. There is a very useful link here on the PSA website where ex-England Squash Physio Jade Elias goes through some of the most common of these using resistance bands and light weights, and we also have our own great video on the site here from physiotherapist and former top squash professional Derek Ryan that goes into a little more detail. Seeing a good soft tissue therapist can also be of benefit, both as a prevention and as a treatment. A lot of athletes nowadays are using the foam rollers for soft tissue work, and with proper guidance from a trained professional certain implements such as ‘The Stick’ can be adapted to be used to provide relief around the affected area in tennis elbow. Renowned conditioning and performance coach Eric Cressey is a big advocate of this kind of soft tissue work, and recommends the use of the stick tool as part of the treatment for many such injuries/conditions as tennis elbow – he has a great 6 part article on the elbow that’s well worth checking out for those looking for a more in-depth understanding of this complex joint. When you feel ready to return to playing following any rest/rehab, it’s important to start gradually and not dive straight back in. Build up just with some light solo hitting, and gradually increase intensity/duration over a period of a couple of weeks. 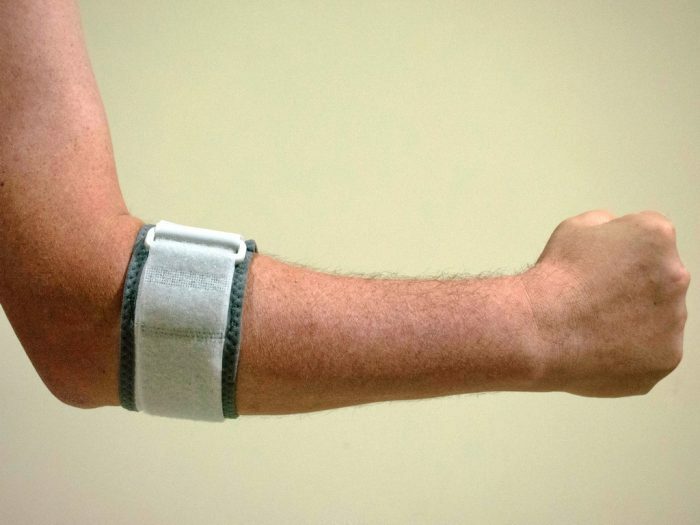 Many tennis elbow sufferers report benefits from specially designed straps worn around the elbow that you may have seen – there’s a good article here that briefly discusses the details and research for these, and they’re well worth a try. 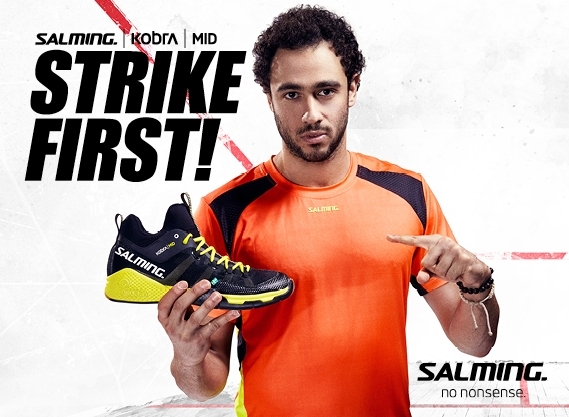 Do be aware that these straps only treat the symptoms of tennis elbow however, and are not a cure. Beyond these specific straps, there is no clinical evidence that any magnetic bracelets or similar pseudoscientific implements can offer any kind of real physical relief. For more chronic episodes of tennis elbow, ultrasound, steroid injections, and even surgery can be used to treat the issue. Interestingly, many experts question whether there is sufficient evidence that any of these costlier, large scale interventions actually perform any better than placebo. I’d recommend that before going down the potentially costly route of any of these treatments, make sure to do your research and discuss thoroughly with your doctor/physio to ensure that it is definitely the right choice for you. Longer term, often just properly strengthening and caring for the joint is all that is needed to recover from a bout of tennis elbow, and to avoid it happening again. Make sure to warm-up before your game! Not having a proper warm-up may result with serious injuries. We can help you to avoid that happening!